The golden eagle is a truly magnificent bird. Although it’s not quite Britain’s largest bird of prey, the white tailed or ‘sea’ eagle takes that prize, nor is it the rarest, but it is certainly the most iconic. The wingspan can be more than 2 metres (6’6”) and a bird can weigh up to 5kg. There are no particular ‘hotspots’ for seeing eagles and their eyries are a closely guarded secret, but if you spend time in the uplands and keep looking up you may be lucky enough to see this great bird soaring around ridgelines, catching the thermals and looking for prey. Most of the Cairngorm mountains have just been declared as an area that is of European importance for golden eagle and we hope to see many more of them nesting and establishing territories here. It's easy to mistake buzzards for eagles, until you see the real thing! 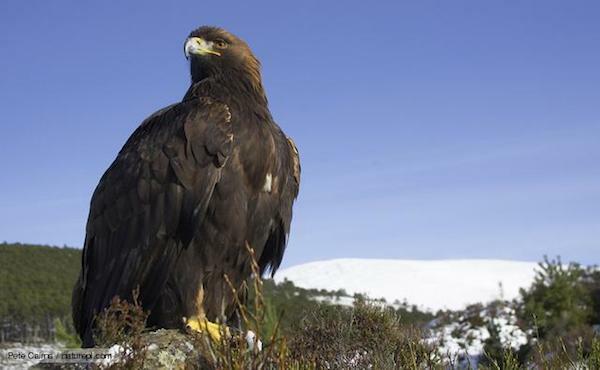 Work is going on across the Cairngorms to help eagle conservation by a wide range of people. Some estates are leaving out deer carcases on the hill as supplementary food and others are creating artificial platforms to help with nesting opportunities. Click on the "Action" tab to the right to learn more about projects that are improving the scientific understanding of golden eagles.